LONDON. March 15.— The battle of the stores began to-day. H. G. Selfridge. a former Chicagoan, opened his perfect eight story department store this morning nnd the establishment was thronged all day. It is estimated that 200.000 people, mostly women, inspected its various departments throughout the day and this despite the fact that without conditions were execrable—a flurrying snow and bitter east wind prevailing. 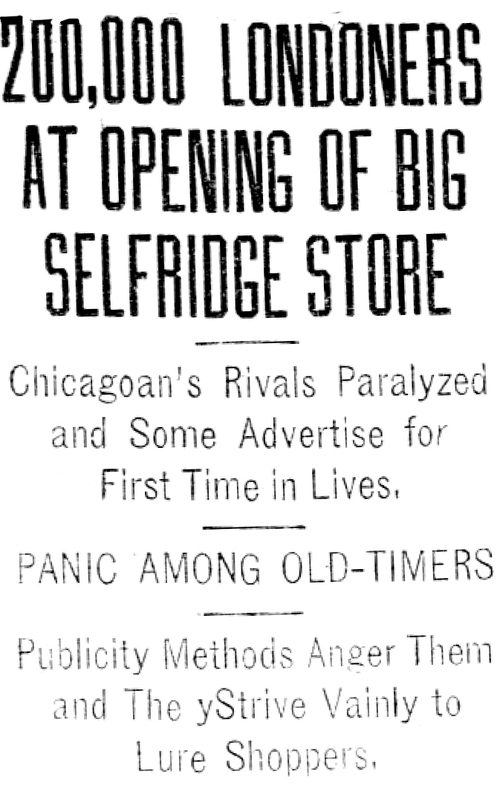 Nevertheless the opening was a success, even though Selfridge’s commercial rivals did everything they possibly could to minimize the success of the Chicagoan’s inaugural day by providing many counter attractions. Londoners, reading their newspapers this morning, were amazed to discover them filled with advertisements. Dry goods stores that never before advertised, firms doing business amounting to many millions of dollars annually their entire business aud which in history had not spent a hundred thousand dollars in advertising, used many columns for their display advertisements. These old-time and so-called conservative merchants are exceedingly jealous of Selfridge. They do not like the American’s wide-awake methods and his invasion of their trade with up-to-date ideas is causing them no little uneasiness. Specifically they dislike the fact that Selfridge advertises. His announcement that he would no more think of doing business without advertising his goods than he would without merchandise has shaken up your time-tried John Bullite. However much these merchants detest the innovation. Selfridge’s competition compelled them 1o follow suit immediately. When the Examiner‘s correspondent visited Selfridge’s store this afternoon he found Oxford street and the sidewalks packed with women of all classes. There were dozens of automobiles with coronets and crests pn their panels. They were lined up the side streets while their aristocratic owners were inspecting the marvels of the first modern department store opened in London. Tens of thousands of their humbler sisters came thronging from __ the penny motor omnibuses and tupenny tubes, also attracted by the same desire. I think we have bad a successful opening. Please tell my former fellow merchants in the United States of America and especially, those in Chicago, how pleased I have been to get their congratulatory telegrams. I hope to show London what the genuinely modern store ought to be. I am here in ihe center cf a population of twelve millions of people and am sure there is room and business enough for us all. I intend to do business strictly on English lines. I am not trying to Americanlze the trade here. There is only one picture in Selfridge’s office; that is a big portrait of Marshall Field. The advertisements in the London dailies this morning carried full pages and were illustrated by the best artists in England, who signed their drawings eluding Bernard, Partridge. Linley and Sambourne, chief of the artists on the Punch staff. 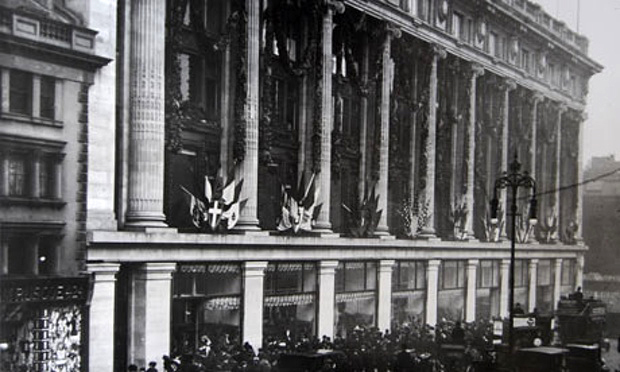 The opening of Selfridges department store in London on 15 March 1909. Here the charm of newness is to be experienced to the fullest, for at Selfridge’s everything is new except the splendid old time-tried principles that must govern it—integrity, sincerity, liberality in dealing and courteous service. Harrod’s store, Selfridge’s chiefest rival, discovered that it was entitled to a diamond jubilee aud advertised it heavily to-day in order to offset Selfridge’s opening. Loudon, however, packed Selfridge’s to the doors. Mr. Selfridge, with his little son Harry, climbed to the top of the magnificent new building this morning and together they hoisted a flag into the whistling north wind. Simultaneously the curtains rose from the vast ground-floor windows the doors swung open and the people began streaming into the store nnd exploring the attractions of the up-to-date example of multiple merchandising as practiced in Chicago. The finest part of the show in Mr. Selfridge’s opinion, was the floral piece from ten or a dozen of the first merchants of State street. Mr. Selfridge has made a great hit with his employes. Ihey say that he is the kindest man they ever have seen, and that unlike London merchants, be pays for all overtime. The paintings in the windows which are attracting great crowds. were done by Mrs. Lois Dunning of Chicago. 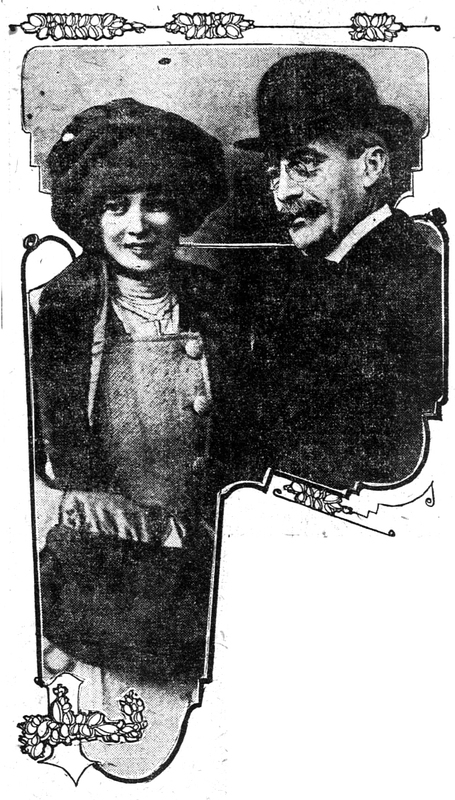 Selfridge Educates Girl in U. S.
Former Chicago Merchant on Flying Visit Here From London; Returns To-Day. “I want my girl to be brought,up as a daughter of the United States.” This was the, statement of Harry G. Selfridge, for the last few years a prominent London merchant, but who won his spurs and reputation as a Chicago dry goods merchant and one of the managers of Marshall Field & Co.
“I came to America on this visit to meet my daughter. Rosalie.” he said, “and I felt that I could only spare twelve days to do so. Nevertheless, I would not think of coming to America without dropping in on Chicago and greeting my many friends here. We intend to leave for New York again on Sunday. I will board the steamer Mauretania on Monday and Rosalie will return to school in New York. Wants Girl Educated in U.S.
“I want my daughter to be educated in America and learn the American customs, because I want her to feel that she is an American girl. And I wouldn’t be surprised if Mrs. Selfridge came over here in the Summer to open up our residence at Lake Geneva. I want to do so and if our plans work out we will do so. “Business men m London don’t seem to realize the value of newspaper advertising and they confine themselves mostly to catalogues. Billboards are very scarce, but those that do exist are very artistic. “London women have just as acute a sense for bargains as the Chicago women have and there is no reason for onr Chicago women trying to claim any advantage in this regard. 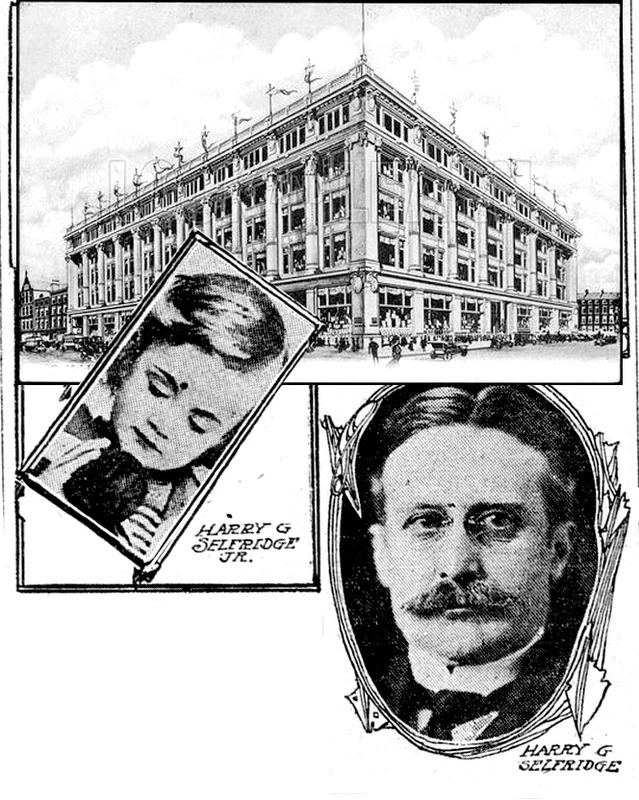 Mr. Selfridge passed the entire afternoon m visiting with friends and business acquaintances, and was dined at the Blackstone during the afternoon by State street merchants. He and his daughter are the guests of Mrs. Frank R. Chandler, 744 Rush street. Buckingham Chandler, a nephew, met the visitors at the train and took them to the Chandler home in an automobile.